We have fully qualified engineers on call in your area today. We offer fixed price repairs with no hidden extras. equipped with the latest diagnostic tools to deliver expert servicing of your appliance, regardless of its age. We have fully qualified engineers on call in your area today. We offer fixed price repairs with no hidden extras. All of our work is guaranteed and we will happily provide free quotations. Covering all Hotpoint, Indesit, Creda, Cannon and Ariston models backed up by the largest service network in the UK we know your appliance better than anyone else. 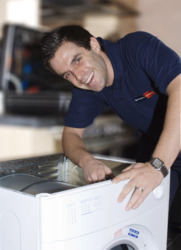 We pride ourselves on ensuring that you â€“ and your appliance â€“ receive the very highest level of care and service. No one understands appliances like we do, so for service from the people that know your appliance best, simply call 08448 224 224. Our operators are on hand to answer your call every day including weekends and bank holidays. We have the largest white goods service organisation in the UK and we are able to provide fast, reliable and local service. All of our engineers have undergone extensive training at our Technical Centre of Excellence and are equipped with the latest diagnostic tools to deliver expert servicing of your appliance, regardless of its age.